Our product range includes a wide range of philips respironics trilogy 202 portable ventilator and philips bipap s/t ventilator. 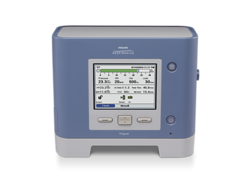 The Trilogy 202 is both a volume-control and pressure-control ventilator for invasive and noninvasive ventilation. The versatile breath delivery and setup options free you from burdensome equipment exchanges, providing greater continuity of care for your patients. Because the Trilogy 202 has the unique ability to compensate for leaks in both pressure and volume control modes, using simpler passive circuits may support significant time and cost savings. With one simple setting change, the Trilogy 202 supports either active or passive exhalation breathing circuits to accommodate changes in circuit preference. Compact design with long-life internal battery for intra-hospital transport. Supports active and passive circuits for invasive and noninvasive ventilation. Philips Respironics, a pioneer in noninvasiv eventilation (NIV) and a global leader in the respiratory medical device market, intr oducesthe BiPAP S/T ventilatory support system.Engineered for comfort and efficiency, this NIV system provides an easy optimization for patient compliance, making their life easier.For patients, the BiPAP S/T delivers NIV therapy by way of a small, light, and quiet platform. Improved humidification adds to patient comfor t as w ell.For clinicians, BiP AP S/T incorporates Respironics’ advanced technologies such as Digital Auto-Trak Sensitivity and integrated alarms that help you pr ovide the best possible patient care. Powered by advanced technologies Digital Auto-Trak detects the onset of inspiration and exhalation and has the ability to recognize and compensate for leaks,both intentional and unintentional.Automatic triggering and cycling means no adjustments are required f or optimal sensitivity. EncorePro provides clinicians with easy access to BiPAP S/T ventilator data via the SD card.This gives y ou the ability to monitor patient compliance, assess ventilation performance, and identify trends to potentially adjust settings in case of changes in patient condition.